For Godard, she played the short-haired young American hawking the Herald Tribune on the Champs-Elysées. Jean Seberg - American Actress confronts the highly precise and typified image of the actress (a Hollywood star before becoming French New Wave muse) with the individual she was in private - until her suicide in 1979. In this way, the film takes stock of the existential abyss that opens to someone who has been so greatly determined by the image. 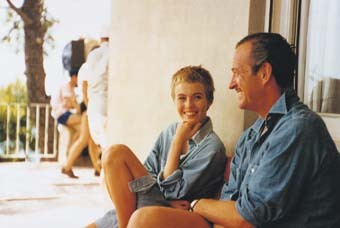 Using film clips, private interviews, press photos and phone conversations, this filmic biography attempts a chronological review of the career of Jean Seberg, with special attention given to each of the documents used, keenly pointing out the tragedy of a woman who could no longer tell the difference between fiction and reality because she was caught up in the cogwheels of the motion picture industry. Fosco Dubini was born in 1954 in Zurich. From 1975 - 1981, he studied Drama, Film and Television at the University of Cologne. From 1977-79, he was a member of the Film Collective Zurich. Since 1991, he has been an instructor at the ESAV Ecole Supérieure d'Art Visuel in Geneva. Together with his brother Dontatello, their films include: BLINDGÄNGER (1983), ÜBER MIR DER HIMMEL, UNTER MIR EIN SCHWARZES LOCH (1984), tHE DISAPPEARNCE OF ETTORE MAJORANA (DAS VERSCHWINDEN DES ETTORE MAJORANA, 1986), KLAUS FUCHS - ATOM SPY (KLAUS FUCHS, ATOMSPION, documentary, 1989), J.K. - EXPERIENCE IN DEALING WITH ONE'S OWN EGO (J.K. - ERFAHRUNGEN IM UMGANG MIT DEM EIGENEN ICH, documentary, 1991), LUDWIG 1881 (1993), JEAN SEBERG - AMERICAN ACTRESS (documentary, 1995), THE JOURNEY TO KAFIRISTAN (2001), THOMAS PYNCHON - A JOURNEY INTO THE MIND OF P. (documentary, 2001), and HEDY LAMARR - SECRETS OF A HOLLYWOOD STAR (2006). Donatello Dubini was born in 1955 in Zurich and died 2011 in Cologne. He pursued Film Studies at the Film Academy in Vienna from 1975-1977, followed by studies of Drama, Film and Television Studies at the University of Cologne. He was a member of the Film Collective Zurich from 1977-1979 and is also a member of the filmmakers' and distributors' initiative "Der Andere Blick". Together with his brother Fosco, their films include: BLINDGÄNGER (1983), ÜBER MIR DER HIMMEL, UNTER MIR EIN SCHWARZES LOCH (1984), tHE DISAPPEARNCE OF ETTORE MAJORANA (DAS VERSCHWINDEN DES ETTORE MAJORANA, 1986), KLAUS FUCHS - ATOM SPY (KLAUS FUCHS, ATOMSPION, documentary, 1989), J.K. - EXPERIENCE IN DEALING WITH ONE'S OWN EGO (J.K. - ERFAHRUNGEN IM UMGANG MIT DEM EIGENEN ICH, documentary, 1991), LUDWIG 1881 (1993), JEAN SEBERG - AMERICAN ACTRESS (documentary, 1995), THE JOURNEY TO KAFIRISTAN (2001), THOMAS PYNCHON - A JOURNEY INTO THE MIND OF P. (documentary, 2001), and HEDY LAMARR - SECRETS OF A HOLLYWOOD STAR (2006).